As February 14 election draws closer, Nigeria’s leading political parties (PDP & APC) are working round the clock to woo voters all over the country. In the past two weeks, the two parties have employed celebrities to carry their messages to fans which they have done effectively. 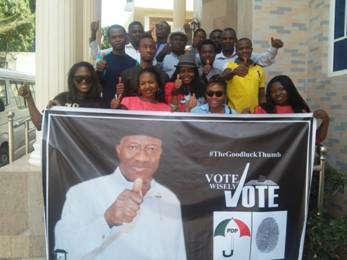 The latest orijo in town is Goodluck thumb being marketed by a GEJ sponsored-group, Activate Nigeria to woo young voters especially undergraduates. 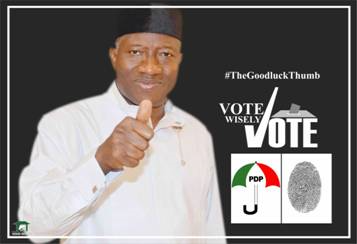 Activate Nigeria is urging youths to visit Goodluck Jonathan rally in their area, pick up Goodluck thumb poster, upload it to their social media accounts and encourage friends to like it.